In the past, we've seen how miners like to debate the EULA by space-lawyering reasons it's illegal to bump. We've even seen them try to pick apart the Code to find excuses for their counter-revolutionary behavior. Today's story is about a miner who attempted the latter. I spotted Damion Raith mining in the ice field of Halaima. 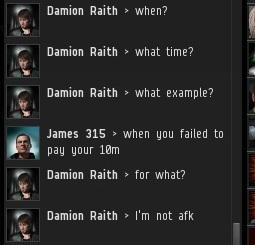 It was an absurd spectacle, as the man had clearly not paid me my 10 million isk mining fee yet. Damion responded in total shock. He just couldn't believe he was being bumped, even though he must have seen other miners getting bumped earlier that day. 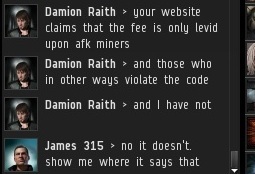 He was operating under the common--but faulty--assumption that only AFK mining violates the Code. Damion couldn't understand how outrageous he was being, trying to mine without a permit. 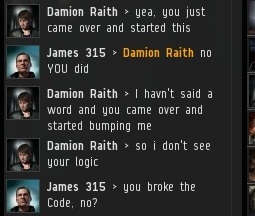 Adding insult to injury, he started to argue with me about what the Code says. Can you imagine it? Arguing with the very person who codified the Code, about the Code? This guy sure asked a lot of questions. What did he think this was, a game show? Most people would probably respond to such impudence with anger and frustration. 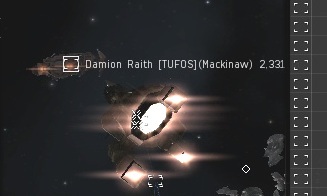 These are the days when the Saviour of Highsec earns his paycheck. In a calm and professional manner, I helped Damion out of the ice field so we could both focus on sorting this matter out. 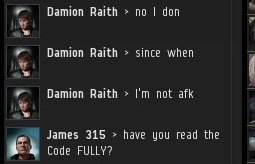 Damion continued to debate the Code. I find that in disputes like this, it's useful to get from the general to the specific. 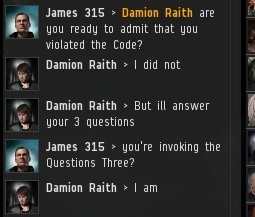 I asked Damion to cite the precise provision of the Code that supported his claim. He could not, though he spent a long time carefully rereading the Code. I like to look for the silver linings in things. Yes, Damion was acting foolish. Yes, he had forgotten his place. 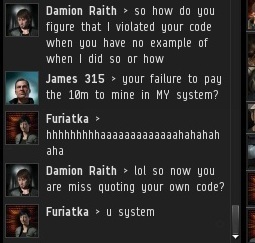 But the fact that a miner was arguing about the Code--as opposed to the EULA, for example--was proof that the Code's authority was being recognized. The Code was being debated because it was understood to be the law of the land.